New construction? Alterations? Comments from employees or visitors? Concerns about lawsuits? 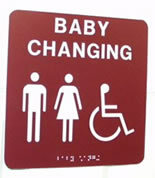 Whether you're adding or changing signage in a present structure or starting fresh, we can help your facility meet the requirements of the Americans With Disabilities Act (ADA) or the Architectural Barriers Act (ABA). We don't pretend to be lawyers but we can assist you in providing architectural and wayfinding signage that is both functional and compliant. 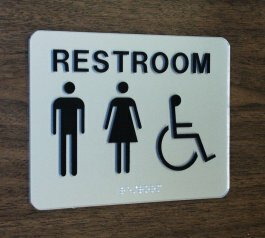 Using ADA-compliant signage shows your commitment to those with disabilities. 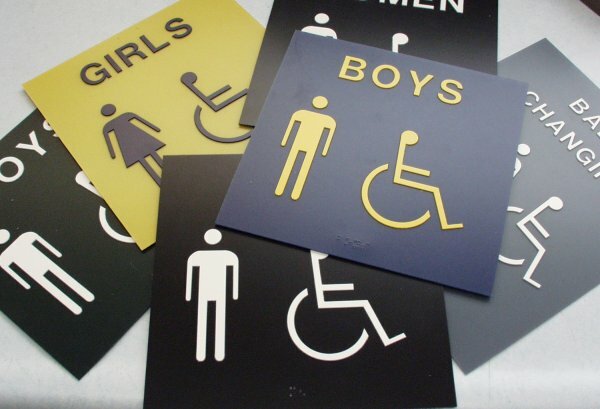 We'll help you with the contrasting color combinations needed to meet the ADA's requirements while designing signage that will enhance your facility both aesthetically and functionally. 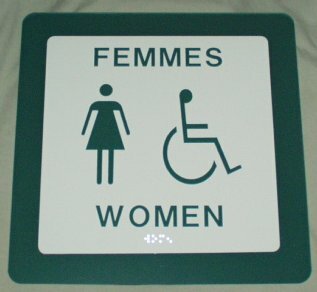 We produce ADA-compliant bilingual signs! Just let us know your needs. 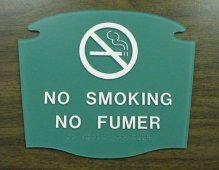 We can produce bilingual signs in any combination of languages. Every customer who's considering ADA compliant signage falls in love with our Framed Signs. Frames come in a variety of colors (if you wish - not a requirement of ADA). 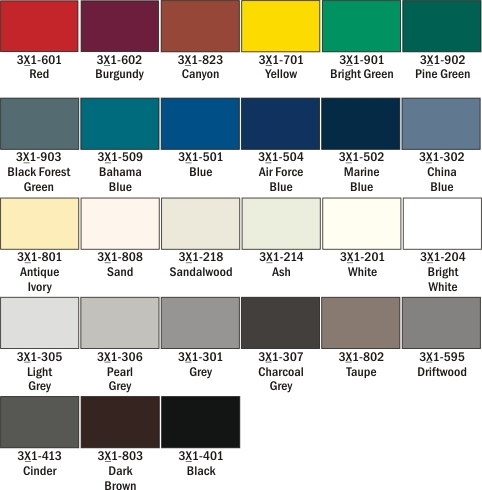 We stock the colors below and can fabricate signs with them immediately. Other colors are available but require a one week lead time and a minimum order. Please ask us. NOTE: To see a larger chip, click on the color below and a new window will open. ** These color samples may not be exact representations of our products. Monitor resolution, color settings and display type can all effect how our color charts are viewed on the Internet. We provide peel-n-stick closed cell foam tape for mounting unless otherwise specified. We can also mat signs for an even more appealing visual appearance as shown in the next picture below, to blend with your business decor. Custom cut shapes are also available. MUST BE DULL OR UNINTERSTING! Just call us and we'll provide simple and easily understood instructions that require the simplest of materials - just a broom stick or anything 60" long and a pencil. 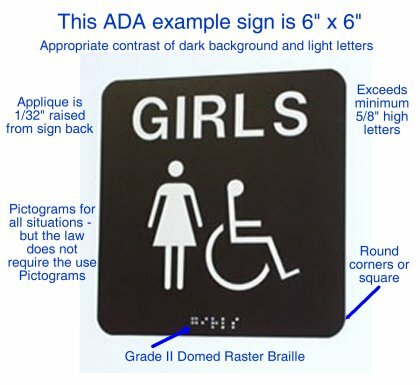 You may wish to visit the ADA Accessibility Guidelines (sometimes referred to as ADAAG) on the U.S. Architectural and Transportation Barriers Compliance Board web site. They have a very interesting online course to help you with an in-depth understanding of ADA requirements. If you'd rather just get going, trust us to provide signage that will help keep your business or building in compliance with the laws. or any other location in or around your business where wayfinding or identification signage will help guide visitors or employees. Compliance is YOUR responsibility! We can help! There's no need for signage to be dull and boring! We can also 'MATTE' your signage to give it an even more professional 'look and feel' and to match with your decor! In this example, we've used a white substrate material with dark green appliqué and a dark green matte on which the substrate is placed. This gives a beautiful raised appearance. And we can ensure that your signage is coordinated throughout your building! 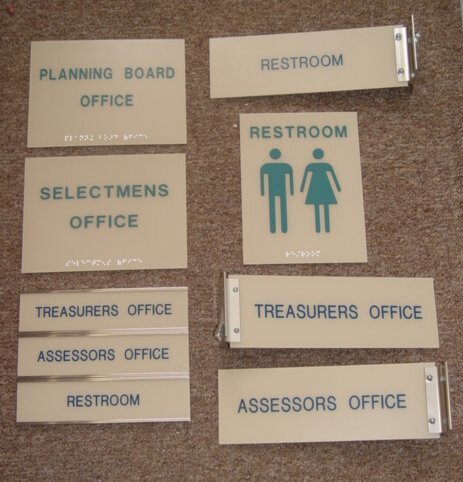 Here is a set of signs we did during August, 2006. 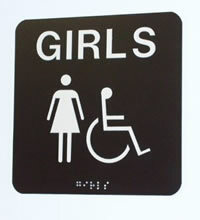 Braille and appliqué is used where appropriate while the other signs are reverse-engraved and paint filled to match. This is an example of how we can help you coordinate your signage throughout your facility, meeting your design needs, and keep you well within your budget as well. 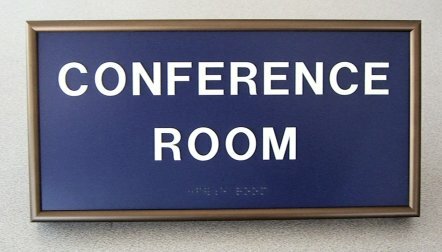 Directories, wall signage, hallway signage - anything you need!